Summary: They are building a statue of RoboCop in Detroit, pointing their youth down a well-worn path leading to a dead end. Links to other posts in this series appear at the end. 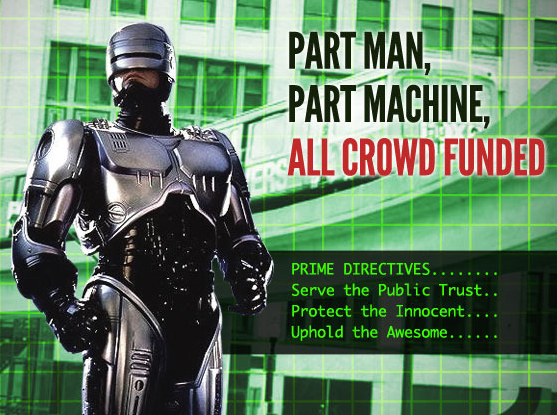 Detroit is building a statue to commemorate Robocop. This is a bad idea. RoboCop is many things to many people. To MT, the accidental city planner who originally proposed erecting a statue of the action hero in a tweet last month, he is “a GREAT ambassador for Detroit.” (The tweet was directed at Detroit’s mayor Dave Bing.) To the people at the public arts nonprofit Imagination Station, who raised the $50,000 needed to create the statue, he’s a potential tourist attraction for the embattled city. To many Detroit residents, activists, and writers, a RoboCop statue is a tragic misuse of effort and resources in a city with nearly 20 percent unemployment. … RoboCop may not represent Detroit’s happiest or proudest moments, and while Robocop himself is redeemed in the end, his city is still in rough shape. But he is a fundamentally good citizen trying to better his city while struggling against the larger forces of big business, corruption, and poverty―forces that he is sometimes helpless against, sometimes even an unwitting part of, but ultimately better than. … RoboCop is thus the perfect symbol for Detroit, reflecting both the city’s persistent will to revive itself and the dangers inherent in doing so. A significant symptom of America’s decline is our inability to see, let alone diagnose, our ills. We run about with fire extinguishers while the ship sinks. For example, while the Fed wages a desperate fight against deflation (potentially lethal to a high-debt society like ours), conservatives scream about imminent hyperinflation (see here for details). This post discusses another and more serious example: we exult in our individualism while our social cohesion frays — wrecking our ability to work together. The popularity of libertarianism is perhaps the manifestation of this (see this, one of the best web posts ever, for a rebuttal of this pernicious ideology). This imbalance is visible in the heroes of our myths. Batman, Spiderman, Robocop — all individuals, loners working without even a team, let alone an organization. They’re fun, but play to our weaknesses. We don’t suffer from too-little individualism, but lack the feeling of national spirit (we’re in this together) that drives our ability to act together. That, not industrial power, was our secret weapon in WWII — as it was in most of our times of crisis since 1776. Cities are collective enterprises. Detroit’s death occurs amidst white flight, crime, drugs, family breakdown, and a host of other social ills. Individual action — no matter how super-empowered — cannot save the city. Our history consists of successful organizations. Such as the Minutemen, wagon trains, Texas Rangers, the San Francisco Committee of Vigilance, and Lombardi’s Green Bay Packers. Plus our great tradition of civic organizations, such the Boy Scouts, USO, and Rotary. Somewhere in there Detroit might find better subjects for their statuary. Remember when statues used to be erected of real people who did great things? If Philly has Rocky, Detroit needs Robocob. There should be a statue of Zefram Cochrane in Montana (inventor of the warp drive; in the year 2063 see his Wikipedia entry}. Rather than viewing Robocop as symbolic of individualism, it may be more useful to view ‘him’ as a metaphor for post-industrial Detroit. “…Robocop is a fin-de-millenium meditation on the exhaustion of modernity. The wreckage of industrial modernity is visible everywhere in Robocop — not only in the graveyards of the steel mills, toxic dumps pushed aside to the margins of the urban metropolis, but in the anarchy of crime-ravaged “Old Detroit,” and in the technified and media-ted spaces of everyday life. Modernity stands as an empty husk which capitalism leaves behind as it exuviates into the new postmodern space, and Robocop attempts to negotiate this territory. Following Best’s interpretation, Robocop is an ideal candidate for a statue in Detroit. Admittedly, it’s not a good model for children.